A research publication on the discovery of “rewritable magnetic charge ice,” co-authored by NIU physicist Zhili Xiao, made the list of the top 2017 stories from the U.S. Department of Energy’s (DOE) Office of Science. The research conducted at Argonne National Laboratory was cited among the DOE’s top five research highlights—summaries of published journal articles at national laboratories and universities based on work supported by the Office of Science. The articles feature findings that the Office of Science chose to amplify. Rewritable magnetic charge ice is a newly developed material that permits an unprecedented degree of control over local magnetic fields and could pave the way for new computing technologies. Current magnetic storage and recording devices, such as computer hard disks, contain nanomagnets with two polarities, each of which is used to represent either 0 or 1—the binary digits, or bits, used in computers. A magnetic charge ice system could have eight possible configurations instead of two, resulting in denser storage capabilities or added functionality unavailable in current technologies. 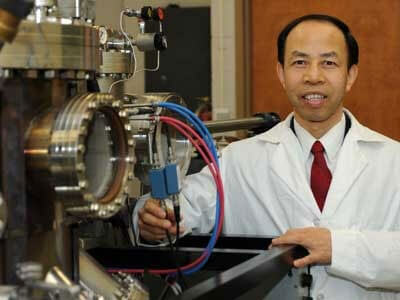 With potential applications involving memory, data storage and logic devices, magnetic charge ice might someday lead to smaller and more powerful computers or even play a role in quantum computing, according to Xiao, who holds a joint appointment between the NIU Department of Physics and Argonne, where he is a materials scientist. Xiao and colleagues first reported on the development in the prestigious journal Science in 2016, when it was covered by the NIU Newsroom. The reconfigurable magnetic charge ice has been utilized to tune the current carrying capability of a superconductor, which was the topic of an invited talk given by Xiao at the 2017 March Meeting of the American Physical Society. He also will talk on the topic at the 2018 Spring Meeting of the German Physical Society.